As Seen In | Press features for our unique wood recessed picture frame medicine cabinet with no mirror! With over twelve years experience selling our original picture frame medicine cabinets and wall niches, plus features in national magazines and television shows, Fox Hollow Furnishings is a brand you can trust! Small Room Decorating Magazine (published by Country Almanac) featured our picture frame medicine cabinet in their Winter 2011 issue. Our espresso recessed medicine cabinet was featured in a 2010 episode of the television show "BATHtastic!" entitled "Finally Finished." To see The Concealed Cabinet's television debut, click the link below and fast forward to 16:25. Real Simple magazine featured our concealed medicine cabinet in their November 2008 issue as one of 9 "double duty" organizing products. "...nosy visitors reading the labels on prescriptions — or even "borrowing" a few — was the first thought that popped in my mind when I saw this clever hidden cabinet..."
Click here to read the rest of this award winning column. 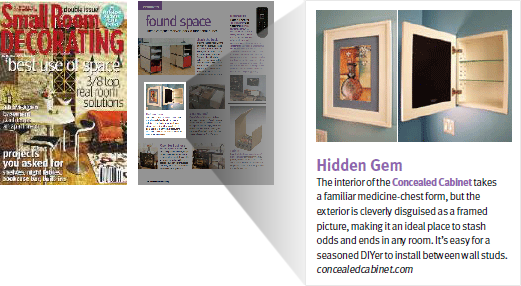 "The Concealed Cabinet gives you the benefit of the recessed cabinet that you can have anywhere because it is hidden behind a picture frame door..."
Our House Magazine featured our in-wall medicine cabinet in their Winter 2008 issue.